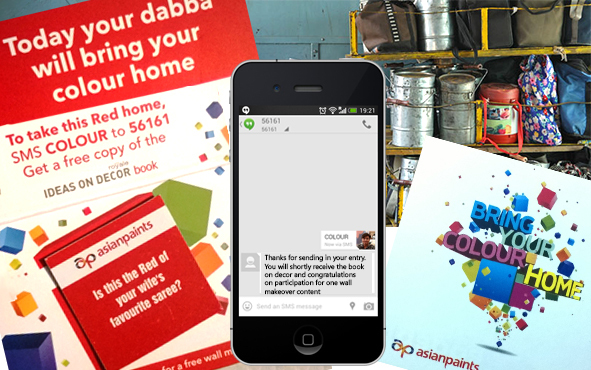 It was a smart marketing act by leading home décor brand asian paints where the card urged to send a SMS with a message ‘COLOUR’ to 56161 to receive a free copy of the IDEAS ON ROYALE DÉCOR BOOK. Moreover, 5 lucky winners would be chosen through a lucky draw for a free wall make over. Now I can hardly imagine anyone not been tempted by this offer. In today’s time where having a wall makeover can cost anywhere between 3,000-6,000 (that’s the least), if someone offers me a free wall makeover, that too by experts at a mere cost of SMS. I’d be crazy not be participate in this mesmerizing offer. asian paints must have had a whooping response considering there are 2,00,000+ Tiffin deliveries across Mumbai. Now that’s some quality leads, ain’t it? I find this marketing strategy awesome for the following two aspects. Firstly, use of Mumbai Dabbawala’s to take the message across & secondly having call for action over Mobile, guaranteeing quick & easy participation. Dabbawalla’s are an epitome of Punctuality, Reliability & Perfection. Any message brought my them would be embraced with respect & given due attention. While Mobile marketing is truly amazing for creating highly creative & interactive campaigns which takes the Advertising & Marketing campaigns on a level above. People don’t have time & need instant gratification of services. Needless to say, Mobile is the key to it. Just imagine that you received this card & were asked to post it back through mail filling in your name & address to participate. What was the probability of you carrying it safely home, filling & posting? Digital Market Asia features an article Mobile paves way for video marketing in India with 3 head honchos, Saurabh Parmar (Brandlogistic), Sushant Mishra (Starcom Media Vest Group) & Vikram Raichura (VivaConnect) explaining how shall Video marketing grow bigger over Mobile in 2014. Vikram Raichura sheds light on opportunities in Mobile marketing that companies seeking to become high-performance businesses can’t afford to ignore, be it videos or other innovative mobile marketing ways.